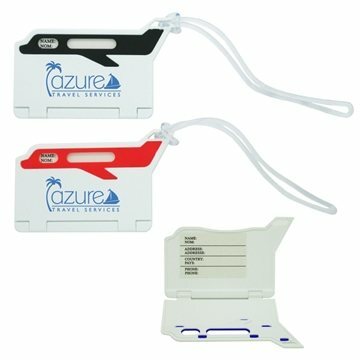 Airplane shaped luggage tag is a simple and elegant tag, which includes a clear plastic strap. Includes name and address card. A fitting promotional product for hotels, travel agencies, colleges and retail stores! They look very good. I kept some for myself. I think this is worth more than what I bargined for. We were very much satisfied with its size, and design. Having our brand stamped into this desk tool tops this item off. It makes it easy for me to hand out a logo-branded reward and not have to worry about it "looking cheap" It was a pleasure dealing with your company. AnyPromo embossed our company logo and we have received numerous compliments on how much they love them. the order with enough time to have it delivered to my event. Very attractive.